Last month we hosted the second annual Bellyak Race for a Cause, as part of the Mountain Sports Festival. 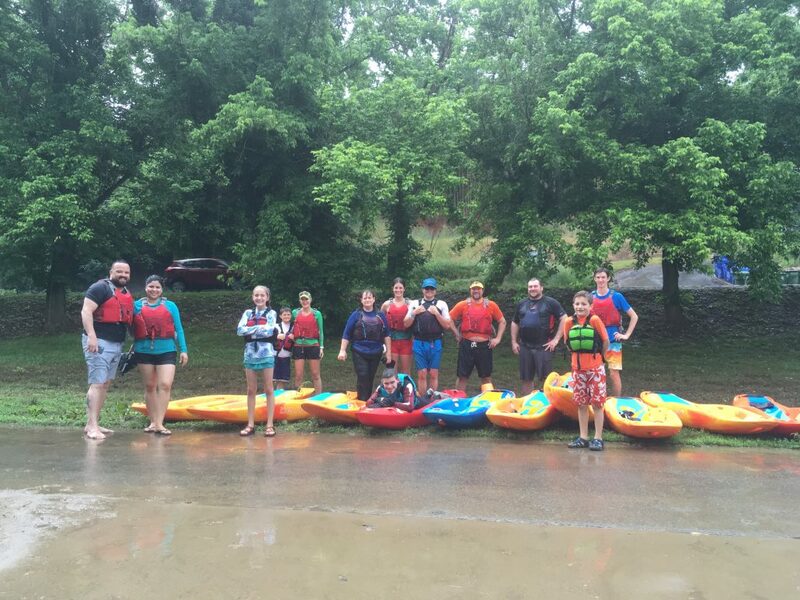 Despite the liquid sunshine that appeared just as we paddled away, it was a great success! We had 13 participants from 7 states and ages from 8 to awesome. Only try this if you weigh less than 70 pounds. The Pollick family represented with their three kids, and we had two newlyweds on a bellyak honeymoon. 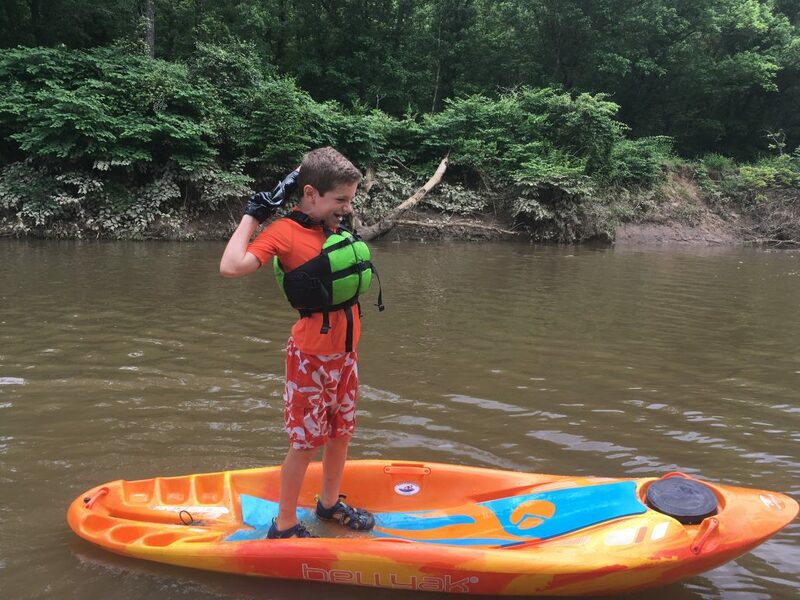 William Blakely, adaptive paddler and Bellyak Ambassador, drove up with his mom, Tammy Lea, to compete for his second time. The kids race saw the hottest competition with a brand new Astral Otter as the grand prize. 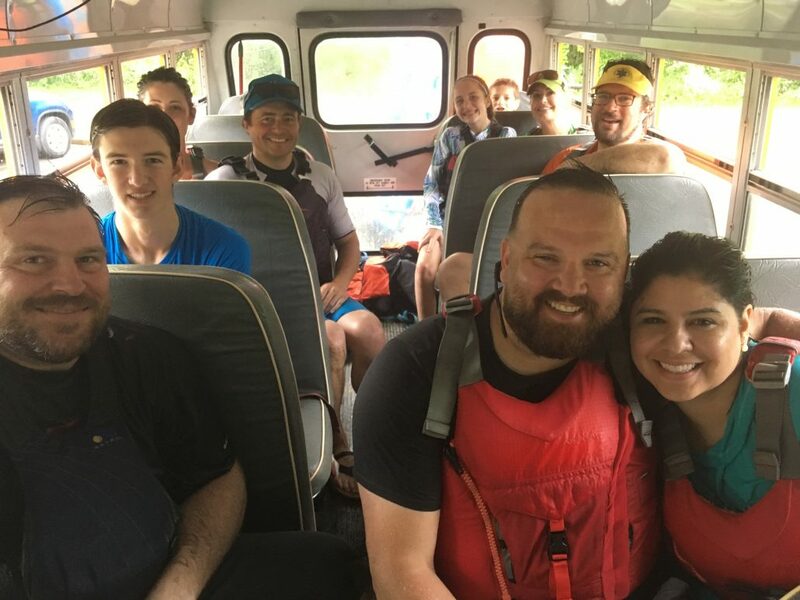 Bets were made, hands were shaken, and we lined up on at French Broad Outfitters – Hominy Creek to begin! A heavy downpour greeted the racers halfway through the course. Looks like more of a ‘Float for a Cause’ here. Since it is a Race for a Cause, our Cause this year is Our Voice. Our Voice are a local non-profit in pursuit of a community free of sexual violence. Our VOICE serves all individuals in Buncombe County affected by sexual assault and abuse, through counseling, advocacy and education. We raised $114 to help support their cause. Join us next year and check out our Events Calendar or follow us on Facebook for more bellyak races, demos and fun. 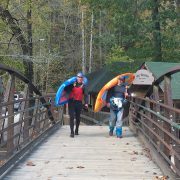 Last weekend was the National Paddlesports Conference at the Nantahala Outdoor Center in Wesser, NC. What an honor it was to be there! 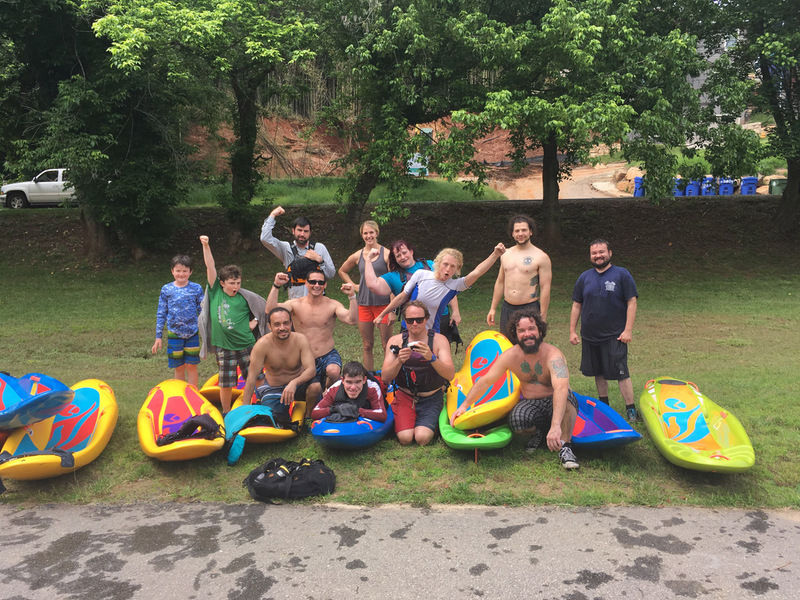 In 2015, ‘Prone River Paddling’ was adopted under the leadership and guidance of Robin Pope, multi-discipline instructor and mentor. What does this mean? It means Bellyaking officially became a discipline with the American Canoe Association. We also now have standardized the instructional arc of bellyak so that others can follow in our footsteps. 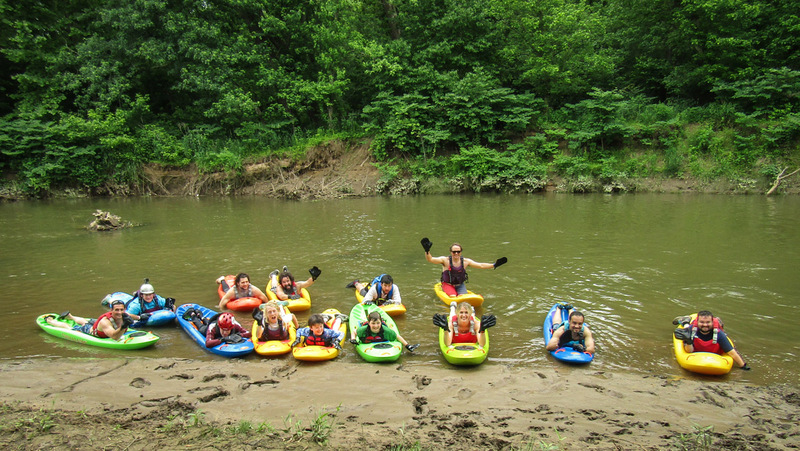 More prone river paddling love to be shared! 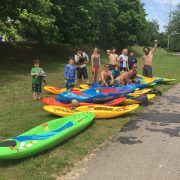 On May 27th Bellyak hosted the first annual “Race for a Cause” as part of the Mountain Sports Festival in Asheville NC. Race day brought water levels on the high side of perfect! The Class 1 river felt like it was moving faster than it was had it been lower. 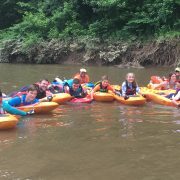 After an ambiguous mass start, 13 racers completed the 1.5 mile sprint from French Broad Outfitters at Hominy Creek to Carrier Park. 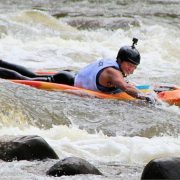 William Blakely represented the adaptive side of Team Bellyak, winning the adaptive category and coming in 9th overall. Eli Masters (nephew of the founder) won the kids division, and Dominic *surname unknown* took the overall win. Genuine plastic trophies were given, webbed high fives were shared all around, and $72 was raised for Our Voice. Our Voice is a local nonprofit in pursuit of a community free of sexual violence. All in all, the best inaugural Bellyak World Championships we could have imagined! Follow us on Facebook for more events!